At certain points in a person’s life, romance and relationships get pushed to the side in order to take care of more important things. Whether that be work, family, or anything in between, those things become the focus of our attention and there just isn’t time or room in life to add the dynamic that another person brings. This is true for both Ace Evans, known to his friends as Beast, and Harper Davis. Beast has a myriad of things that require his attention – between being the leader of one of the most prominent biker gangs in Las Vegas, running an auto repair shop, and an ex-girlfriend who doesn’t seem to understand the word “no”, he doesn’t have room on his plate for much else. Harper, on the other hand, has relocated herself and her nephew in order to escape from her drug-addicted sister and give her nephew a better life. The house they move into happens to be next to Beast’s and to say they are less than friends from the beginning would be an understatement. However, people can be brought together by the strangest things, even the things that seem to be keeping them apart. 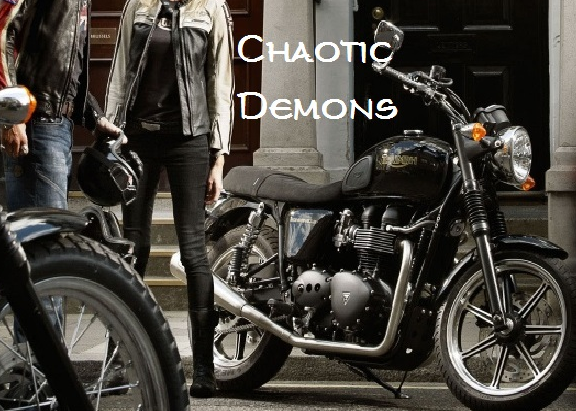 Filled to the brim with drama between family and friends, Chaotic Demons will pull you in and leave you wanting more. Currently sitting at 8 chapters, Lady.V. and Chris Cerilli; do a great job of introducing the reader to their characters and setting up for some interesting twists and turns in the plot. If you’re looking for a story that will capture your attention with a promise of drama and romance, give this one a try! July 14th, 2017 at 08:39am, losing control.